Leadership Agility is the master competency needed for sustained success in today's complex, fast-paced business environment. 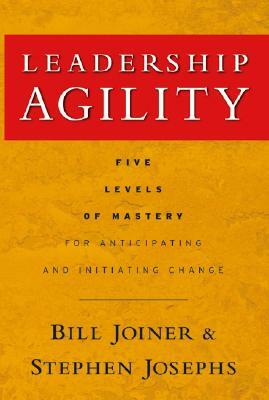 Richly illustrated with stories based on original research and decades of work with clients, this groundbreaking book identifies five levels that leaders move through in developing their agility. Significantly, only 10% have mastered the level of agility needed for consistent effectiveness in our turbulent era of global competition. Written in an engaging, down-to-earth style, this book not only provides a map that guides readers in identifying their current level of agility. It also provides practical advice and concrete examples that show managers and leadership development professionals how they can bring greater agility to the initiatives they take every day. Bill Joiner & Stephen Josephs are world-renowned consultants and executive coaches whose clients include Aetna, Corning, Dell, EMC, IBM, Hewlett-Packard, MIT, Sun Microsystems, Sunoco, and Travelers. They are partners in ChangeWise, a leadership and organization development firm with offices in Boston and San Francisco. Bill Joiner is an adjunct faculty member at the Winston Center for Leadership and Ethics at Boston College, and received his doctorate from Harvard University. Stephen Josephs is a master coach with degrees from the University of Massachusetts, Harvard University, Antioch College, and Clark University.